This is an easy recipe for braised chicken thighs with Tunisian flavors, courtesy of Los Angeles, California chefs, Jon Shook and Vinny Dotolo for Plated.com. I made this dish for a second time with a variation to original recipe. I used skin-on, bone-in thighs and chicken drumsticks instead of skinless chicken thighs. Why? Well, you will get a better sear and slightly deeper flavor with the skin still. Using skin-on, bone-in chicken thighs will also increase the cooking time and always be sure to check that your chicken is for completely cooked at the proper temperature by using a meat thermometer. 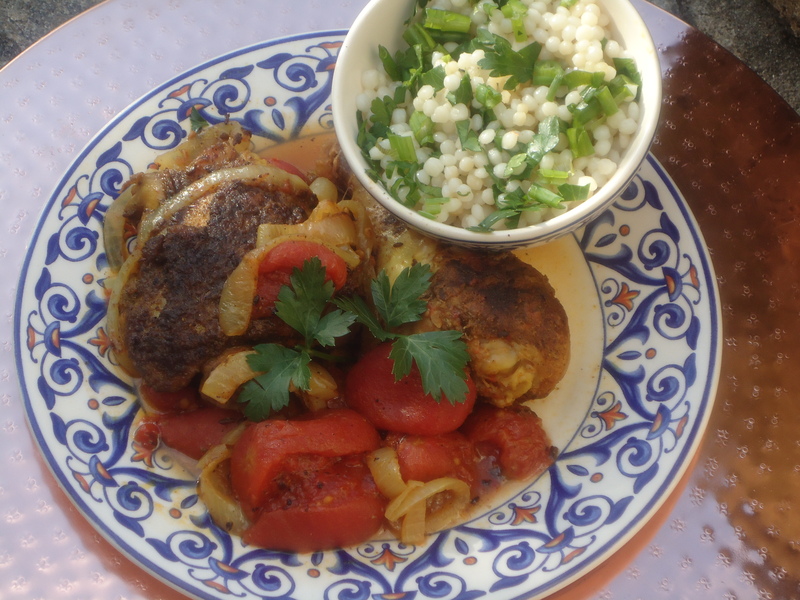 This dish is best served with couscous or steamed white rice. To make Spice Mix 1:In a small bowl, combine the cinnamon, paprika, caraway, coriander, and cumin. Stir everything together and set aside. To make Spice Mix 2:In a small bowl, combine the turmeric, chile powders, coriander, caraway, and cinnamon. Stir everything together and set aside. To marinate the chicken:Rinse the chicken, pat it dry with paper towels, and arrange the pieces on a large plate. In a small bowl, combine Spice Mix 1, the garlic, Thai chile, and 2 tablespoons of the olive oil. Coat the chicken with this mixture, rubbing it in thoroughly. Allow the chicken to marinate for 10 minutes at room temperature, or overnight in the fridge, covered with plastic wrap. Heat the oven to 400°F and arrange a rack in the middle. Season the chicken thighs all over with salt and pepper. Over medium-high heat, heat the remaining 2 tablespoons of olive oil in a large, heavy-bottomed sauté pan with high sides and a tight fitting lid. When the oil is shimmering, add the chicken and sear on the first side, 2 to 3 minutes. Using tongs, flip the pieces and sear on the other side, 2 to 3 minutes more. Remove from the pan and set aside. Reduce the heat to medium and add the onion and Spice Mix 2 to the same pan in which you seared the chicken. Sauté until the onion is very soft and translucent, about 7 minutes. Add the tomatoes and stir to combine. Raise the heat to medium-high and bring to a simmer. Add the reserved chicken to the simmering tomatoes, nestling the pieces into the sauce. Cover the pan and transfer to the oven. Braise until the chicken is tender and cooked through, about 10 minutes. Taste the braising liquid and add additional salt and pepper as needed. Divide the chicken and sauce evenly between two warmed, shallow bowls and serve. Many older recipes call for salting raw eggplant before cooking it to temper the vegetable’s tendency toward bitterness. These days the bitterness has largely been bred out, but salting eggplant is still a good way to reduce the amount of oil that this versatile vegetable absorbs. For even more aroma and herbaceous flavor, add fresh mint and cilantro leaves to the basil for garnish. 4 Japanese eggplant or other small, oblong eggplant, about 1 lb. Trim the eggplant and cut into halves or thick slices. Put the eggplant into a colander, sprinkle with 1 teaspoon salt and toss to coat evenly. Set the colander in a sink and let the eggplant stand for 10 minutes. Meanwhile, pour the tomatoes and their juices into a bowl and crush the tomatoes with your hand or a potato masher. Set aside. In a large sauté pan or wok over medium-high heat, warm the olive oil and garlic, swirling the pan to flavor the oil, until the garlic starts to sizzle but does not color, about 1 minute. Add the salted eggplant and stir until well coated. Pour in 1/4 cup water and bring to a boil. Cover, reduce the heat to medium-low and cook until the eggplant is tender, about 10 minutes. Uncover and gently stir in the tomatoes, cumin, paprika and coriander. Increase the heat to medium-high and let cook at a brisk simmer, shaking the pan occasionally, until the tomatoes thicken, about 10 minutes longer. Remove from the heat and discard the garlic, if desired. Transfer the eggplant to a serving dish and sprinkle with the basil leaves and the preserved lemon. Serve warm or at room temperature. The winter doldrums continue and there is nothing more perfect than a comforting bowl of chicken soup to warm your soul. This is not your grandmother’s chicken soup and dumpling recipe, unless you’re fortunate enough to have a Cuban grandmother. With its long simmering time and the addition of calabaza, a tiny orange-and-white squash, this is a wonderful way to warm up on a chilly day. The additional of Bijol, a traditional Cuban blend of ground achiote, cumin and corn flour, infuses the soup with a pleasant yellow color, but if you don’t have a Latin specialty market in the neighborhood, a pinch of turmeric makes a good substitute. The plantain dumplings are a lovely combination of sweet and savory, but they do not hold well. If you have leftover soup, the dumplings will completely disintegrate overnight. If you are not planning to eat all the soup in one dinner serving, add only enough dumplings to suit your hunger pangs, then freeze the soup without dumplings and whip them up whenever you are ready to dive into the leftovers. And like every recipe, this soup has many variations throughout the Caribbean and Latin America. In Ecuador it is known as Caldo de Bolas and in Columbia, it is called Sopa de Pollo y Platano Verde. Where as in Puerto Rico it takes on the name Sopa De Pollo con Mofongo which is considered the Puerto Rican version of Matzah Ball Soup. Imagine that! In a large pot over high heat, combine the chicken, onion, celery, carrots and garlic. Add the chicken stock and bring to a boil. Reduce the heat to low and simmer for 25 minutes. Using tongs, remove the chicken from the pot and set aside to cool slightly. Using 2 fork, shred the chicken into bite-size pieces. Return the chicken to the pot and add the squash, tomatoes, cumin cinnamon and Bijol. Simmer over medium heat until the squash is tender, 10 to 15 minutes. While the soup is simmering, make the dumplings: Place the plantains in a microwave-safe bowl with 2 teaspoons water and cover the bowl tightly with plastic wrap. Microwave until very soft, about 2 minutes. (If you don’t have a microwave, place the plantains in a fry pan with 1/3 cup water, cover with a tight-fitting lid and cook over medium heat until the plantains are soft, 12 to 15 minutes. NOTE: Do not use any more water than this or the plantain’s sweetness will leach out into the water. Sprinkle the plantains with the salt and pepper and mash them with a fork until smooth. Add egg, cornmeal and rice flour to the plantain mixture until a combined. Roll the mashed plantain into smooth balls about 1 inch in diameter. Drop the plantain dumplings into the soup and cook for 10 minutes. Remove the soup from the heat, season with salt and pepper, and stir in the parsley. Ladle into bowls and serve immediately. Six to seven bone-in chicken thighs can be substituted for the chicken breast if you like more flavor to the soup. If Bijol or tumeric are not readily available, Goya Sazon Culantro y Achiote® seasoning is available in most major supermarkets and grocery stores. With its combination of garlic, cumin, coriander seed, it can be the perfect seasoning for this soup, also giving a vibrant red orange color that is visually appealing.